The Climate Crusader is flaunting her brown grass. No, really. The dog days of summer have definitely come to my corner of the Pacific Northwest. It looks like we may have the driest July on record this year, if the rain can hold off for a couple more days. It's unusual for us to go a whole month without precipitation here in Vancouver - a city that locals often call 'Raincouver'. We're all welcoming this uncharacteristically beautiful summer. My garden is loving the warm, dry weather. I've had an early bumper crop of raspberries, blueberries, broccoli and cauliflower, and my corn, beans and tomatoes are going strong. I water it every couple of days, in the morning or evening when the water is less prone to evaporation. As long as they plants have plenty to drink, they flourish in the sunshine. My lawn, on the other hand, is less happy. 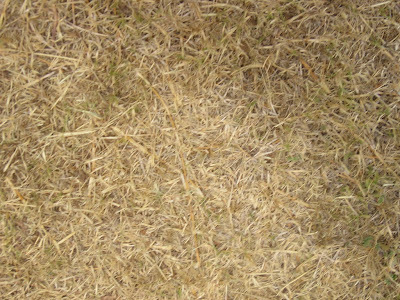 The grass is brown and dead, and we haven't had to mow it for weeks. While some of my neighbours are still sporting lush, green, golf-course-quality grass in front of their houses, my yard is decidedly lackluster. Add in the healthy sprinkling of weeds that take up residence and you definitely wouldn't see my home in any magazines. My local region imposes lawn-sprinkling restrictions during the summer months, but the truth is that I don't water my lawn at all. While I can justify watering food plants, spraying drinking water on grass feels wasteful. In fact, while my region does allow homeowners to water up to twice a week, they actually suggest that it's better to just allow your lawn to go dormant and dead over the summer months. Other greenies agree. When it comes to summertime lawns, brown is the new green. Of course, there's another option when it comes to dealing with your yard, and that's to forgo grass altogether. Some eco-minded folks plant drought-resistant plants, with an eye to reducing their water consumption and creating wildlife habitats. Native plants are an especially good choice, because they evolved to thrive in the conditions found where you live. Here in the Pacific Northwest that means they can handle months on end of rain, followed by drier summer weather. They also don't require much care in terms of weeding, fertilizing and so on. One final option is to rip out the grass and plant food crops. That's not a great option for my front yard, because it's shady and overly damp most of the year. If you can do it, though, it's a great way to reduce your food miles and reduce the amount of lawn you have to care for. Groups like Food Not Lawns have sprung up to spread the word on this growing movement. Whatever way you go, if your lawn looks like mine right now, I say you wear it with pride. It might not be much to look at, but living lightly on the earth is more beautiful than grass in my book, by far. Hear hear to not watering your lawn! Mine looks just as brown and I have to wear flip flops to walk on it because it is crispy under my feet now (ouch). Bonus is that I don't need to mow it nearly as much: I was averaging three times over a two week period in the spring but now I can go up to a week and a half, and even then I only need to do the patches that actually grow. We have had an unusually cool and rainy summer here in the midwest. I haven't watered but my yard is so green! Normally it's very brown by now. I'm trying to plant all drought resistant plants and it seems to be working! I've never been brave enough to try this -- even with the back lawn. Also, I've always been a renter, so it really wasn't an option. It mentions on the metro vancouver site to keep people off the grass when it's brown and dry. That's not really possible with small children -- what do you think? Would a lawn survive no water/ going brown with kids playing on it all winter??? Who Wants a Love Letter? The Green Phone Booth is a cooperative of independent bloggers. The opinions expressed in each post are those of the author and are not necessarily shared by other writers at The Green Phone Booth.